Aging and dental health go hand in hand. Paying attention to oral hygiene becomes second nature when considering tooth decay, gum disease, or other tooth problems that crop up if maintenance is neglected. If left untreated, damaged or missing teeth can cause unnecessary embarrassment when eating, slurred speech when speaking, and a dip in your personal confidence. 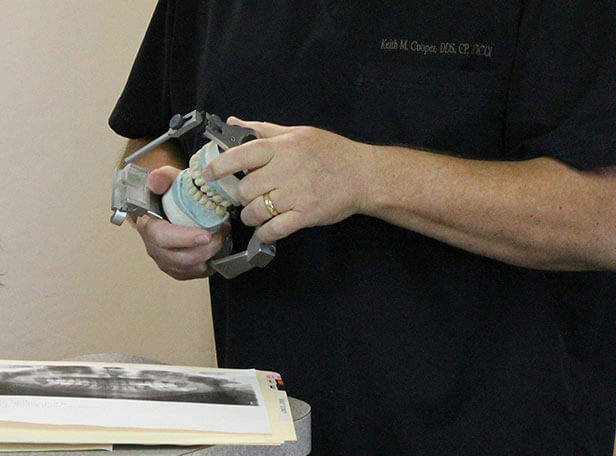 Dr. Cooper and the Contemporary Dental Arts team have a restorative solution to fix your dental problems. If you suffer from extensive tooth loss, consider Teeth in One Day, a long-lasting alternative to traditional restorative options. Teeth in One Day uses the All-on-4® method to replace an entire arch and was designed to give patients more security. Unlike traditional dental implants, All-on-4® can be placed in patients who have deteriorating jawbone density. In fact, there’s no need for supplemental procedures. All-on-4® replenishes your smile while giving you all of the natural function, support, and stability of real teeth. Aside from the innovation and convenience, the All-on-4® method quickly restores your smile with natural-looking teeth that don’t require special maintenance. Because they are attached to your jaw, they continue to provide the much-needed stimulation that originally came from your natural tooth’s root. This prevents bone resorption and helps keep your facial structure in perfect condition. If you’re suffering from extensive tooth loss or decay, Teeth in One Day using the All-on-4® technology can be the answer to your smile dreams. To learn more, request your consultation today with Dr. Keith Cooper. At our San Jose, CA practice, your success is our success.